It's got all kinds of fun nooks and crannies. Hint -- moving your cursor and clicking will produce many wacky effects on most of the pages. I used to just laugh out loud at various elements of it, especially at the Bubblesoap site. (Caveat surfer: J.Otto Seibold is a children's book illustrator, so there's nothing lewd or anything, but it can be loud.) Here's to Turtlecar! A Certain Someone who is as generous as she is cool and hilarious completely surprised me last night (en route to KIP) with one of these shirts! I can't get a good photo of my own, but I'm wearing it now and love it. Thanks so much, Carolyn!! And my hat is off to Amber, while we're on the subject -- the Knitting Tarot deck is just delightful. KIP was lots of fun, as usual. I'm slogging through the top portion of the back of my husband's vest. The thing about this brioche stitch is that while the right-side row is mindless (knit it), the wrong side row is not. I thought this would be a good break from my usual thing of stockinette with some moss stitch at the bottom. Brioche stitch is nice enough and produces a thick and cushy fabric...but to my eye it doesn't have the same visual payoff of cables, for example. At the same time, it takes too much concentration on the wrong sides to read while knitting those rows, so I'm sort of getting the worst of both worlds. Not the worst, really, but it is something for me to keep in mind in choosing future projects. Yikes!! But a fifth Thursday in a month can mean only one thing -- a bonus KIP! Yesss! I'll be taking the Interweave Knits vest in brioche stitch that I'm making for my husband. It began life in February, hibernated for several months, and is now back to haunt me. No, not really. Thank God it's just a vest, though. Say, Greta, maybe Letizia's (home of KIP) will have brioche tonight! I think of your comment (and begin drooling) whenever I think of the stitch's name on this baby. P.S. Go see what a cute little nephew Carolyn's got!! I cast on for the second sock Friday morning and finished it Sunday evening. I have more than my share of knitting foibles, but Second Sock Syndrome so far has not been one of them (knock wood). Obviously, we didn't do a whole lot outside the home this weekend, but after much madness last weekend, I definitely needed a break. The gray is Dale Baby Ull, and the blue/white is Regia Self-Patterning Something or Other. I wish I had placed the stripe a little lower on the cuff, but that's all right. I like the Baby Ull for socks. I'll see how it wears. I made a very similar pair of socks for my sister a couple of years back. She was going to spend the winter in Ireland, and the socks were named "Irish Skies" because wintertime there can seem pretty gray, but blue sky and clouds put in occasional appearances. 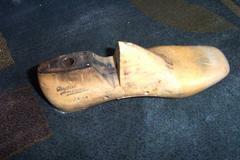 I decided in the summer of 2001 that I was going to learn to make shoes. Yes, that's what I decided. So I bought three lasts from Architectural Artifacts and got online. Not much doing; lots of medieval-ish leather jobbies, but I had been thinking more Manolo-esque. Like you could learn to make Jimmy Choos online. Fortunately, not long after this silly detour into Things I Know Nothing About, I happened into a knitting store and got a kit to make a pair of socks -- still footwear, but different altogether. 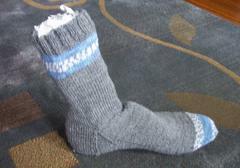 Come to think of it, I finished my second-ever sock the week of Sept. 11, 2001, while glued to the TV. OK, I can't leave you on that note -- have you ever heard this joke? Because if not, I think I made it up. Q: Why don't dolphins like lobsters? A: Because they're very shellfish. Clark and I went to the Sting and Annie Lennox show last night -- both gave tremendous performances, as near as I could tell. I'm not the most knowledgeable fan of either of these highly accomplished people, but I certainly enjoyed myself. Sting's rendition of Synchroncity II (the one about the clueless suburban middle-manager type, on the one hand, and the "something" crawling to the surface of a dark Scottish lake, on the other) connected my past with the present in a way that surprised me. I got that album from the Columbia Record and Tape Club for ONE CENT (or was it one-twelfth of one cent? ), you know, but hadn't thought about the song more than superficially in years. I remember being impressed with myself as a kid for figuring out that the singer was Criticizing Society. But I worried about the people in the cottage when the monster crawled to the shore...Then, last night, there's Sting actually SINGING it, pretty far away but still in the same basic time zone. Plus I had some plastic opera glasses, so he looked somewhat closer. Anyway, it was quite wild. His eyes really sparkled as he sang (I could tell on the Jumbotron thing.). If that's just the stage lights, and not really passion for performing, do not tell me. The knitting connection -- and there is one -- is that I knew we'd get to our seats plenty early, so I packed the sock I'm working on into my little purse. Bag search, pat down, Security Guard 1 does not like the look of the knitting needles. Asks Security Guard 2, who declines to allow them entry. A discussion ensues because, while it's been made clear that "missiles" are not allowed, knitting needles are not specifically prohibited, nor are they "missiles." Am I going to use the sock needles as mini-javelins? I realize, however, that they could conceivably deny me as well as my sock entry, so I turn on my heel to go. "You could poke somebody's eye out!!" Guard 1 then yells, rather unnecessarily, really. I suppose that's true; I just hope they also caught all the pens and pencils that evil concert-goers were trying to sneak in. In any case, as far as I know everyone left the concert with the same number of eyes they entered with. I meant to find one of those "Knitters are Not Terrorists" T-shirts today. Hey, Chicagoans and all you in Chicagoland, consider hitting the Sheffield Garden Walk this weekend. Unlike many of Chicago's summer bashes, this one is sort of a two-pronged fest: on the one hand, it is the typical neighborhood block party with food, beer, and bands, but on the other hand, it gets its name from the 100 or so neighborhood homes whose owners open up their back gardens to anyone who wants to tramp through. You would be amazed at the creativity that some people can exert in a space just slightly wider than a computer screen! Seriously, though, it's a lot of fun. Swing by the booths in front of St. Vincent's on Saturday evening to say hi! The other imminent Main Event, tonight's KIP, will sail along merrily without me until 8:15 or so, when I hope to be able to pop in and see what beautiful projects are on the needles this time 'round. You generous souls have my Official Permission, starting today, to bug me about going to the gym. It's not funny anymore, how little I'm exercising. And it's summertime, for heaven's sake! I should be burning all kinds of calories, either in the gym or on my bike or SOMEWHERE! It wasn't perfect, but the top of the tee kept the stitches from slipping off the back end, which I appreciated. I only needed to move 4 stitches around at any given time, and the diameter of the tee was just right. I usually use a double-pointed needle, but the ones I have are longer than is really convenient. I got a copy of Knitting on the Edge (the link is to Amazon's page for the book) yesterday and just like it a lot. So many good ideas!! OK, and also a fair number of options that will never see three dimensions at my hands, but it's still a neat book. It has only a handful of complete patterns, but one of them is for a sweater that would, I think, be perfect for Kidsilk Haze (though that's not what's recommended). It's the light green one with the leafy lacey beady edging. I would love to make this, though I would do it with short sleeves and a different neck treatment, I think. Oh, I talk big, don't I? I'm a few days late and a few dollars short, but thank you very much to the wonderful commenters (commentors? can I get a ruling, here?) for your kind words about Kate! It's a lot of fun to wear. I forgot a couple of things in my earlier post that might be of interest: I used about 6 1/4 or 6 1/3 balls of All Seasons Cotton. It was a bit irritating to use relatively little of a (not cheap) 7th ball, but if I can't take the heat I should obviously stay out of the Rowan. Also, I did only 3 inches of ribbing throughout, though the pattern calls for more (something over than 4 inches, if memory serves). I am short-waisted and didn't want the ribbing to go too high -- though now that it's all assembled, I don't think the extra ribbing would have looked as bad on my old bod as I initially feared. Hope your week's off to a good start!